Michigan will see several interesting congressional races in 2018, with one open seat. 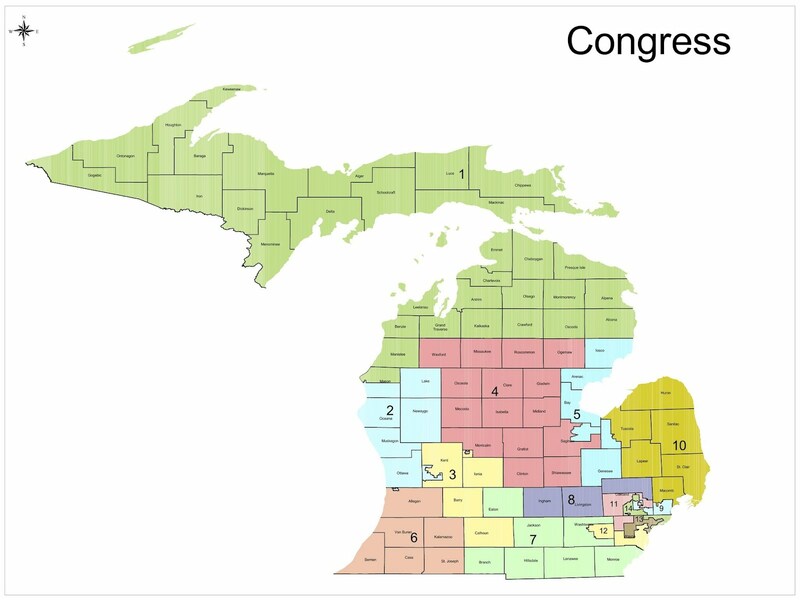 Michigan has 14 congressional seats. There are several articles that analyze the general political leanings of the districts. District 1 (Upper Peninsula, Northern Lower Peninsula) Safe Republican. Following the retirement of Dan Benishek, conservative retired general Jack Bergman defeated moderate state senator Tom Casperson and former senator Jason Allen 39-32-28 in the R primary. He defeated former Michigan democrat chairman Lon Johnson, a liberal who bought a small house in Kalkaska County, in the general. Veteran Matt Morgan is running for the D nomination, but may be disqualified because he messed up his petitions. District 2 (Ottowa, Muskegon) Safe Republican. Republican former state rep. Bill Huizinga won a close primary in 2010 to replace Pete Hoekstra, and was easily reelected since then. He has generally voted a fairly conservative line. This remains the most Republican district in Michigan. Robert Davidson and Nick Schiller are running for the D nomination. District 3 (Kent, Calhoun) Safe Republican. Republican state rep. Justin Amash won the primary to replace moderate Republican Vern Ehlers, in 2010. Amash is a libertarian in the mold of Rep. Ron Paul. He has alienated the establishment in Washington and some Trump supporters. He defeated moderate businessman Brian Ellis, who had significant self-funding, 57-43 in the 2014 primary. Joe Farrington is challenging him in the primary. Cathy Albro and Fred Wooden are running for the D nomination. District 4 (central Michigan) Safe Republican. Republican state senator John Moolenaar of Midland defeated self-funding businessman Paul Mitchell and Tea Partyer Peter Konetchy 52-36-11 in the 2014 primary to replace retiring congressman Dave Camp. He has won easily since then. Jerry Hilliard and Zigmond Kozicki are seeking the D nomination. District 5 (Genesee, Saginaw, Bay) Safe democrat. Former Genesee Treasurer Dan Kildee succeeded his uncle Dale Kildee in 2012. Travis Wines is the R candidate. District 6 (SW Michigan) Safe Republican. Moderate Republican Fred Upton has won by wide margins since defeating conservative Mark Siljander in 1986. Upton defeated Western Michigan University professor Paul Clements in 2014 and 2016. Clements is running again, along with former Kellogg lobbyist George Franklin, Matt Longjohn, David Benac, Rich Eichholz and Eponine Garrod. District 7 (south-central Michigan) Safe Republican. Republican Tim Walberg defeated liberal democrat Mark Schauer in a hard-fought race in 2010. This followed Schauer’s defeat of Walberg in 2008, Walberg’s defeat of RINO Joe Schwarz in 2006, and Schwarz’s winning a divided Republican primary to replace Nick Smith in 2004. Walberg defeated D state rep (12-16) Gretchen Driskell in 2016. She is running again in 2018, along with Steven Friday. District 8 (Ingham, Livingston, N Oakland) Likely Republican. Former state senator Mike Bishop of NE Oakland beat state rep. Tom McMillin 60-40 in the 2014 Republican primary to replace retiring congressman Mike Rogers. Bishop defeated Macomb County assistant prosecutor Suzanna Shkreli in 2016. Lokesh Kumar is challenging him in the R primary. Former DOD official Elissa Slotkin is running for the D nomination, along with professor Christopher Smith. District 9 (S Macomb, Royal Oak, Bloomfield) Safe democrat. Democrat Sander Levin, who has represented this district since 1982, is retiring. D candidates include his son Andy Levin, state rep Ellen Lipton (08-14), and Martin Brook. Macomb state sen. (10-18) Steve Beida withdrew at the last minute, depriving Macomb Ds of the chance to elect one of their own. Businesswoman Candius Stearns is the R candidate. District 10 (N Macomb, the Thumb) Safe Republican. Following Candice Miller‘s retirement, self-funding businessman Paul Mitchell won the R primary 36-28-16. Mitchell previously lost the Republican primary in district 4 in 2014 and led the fight to defeat proposal 1, a large tax increase. He beat former state rep Frank Accavitti (02-08) in the general. Accavitti, Kimberly Bizon, and Michael McCarthy are seeking the D nomination. District 11 (NW Wayne, SW Oakland, Troy) Lean Republican. Establishment Republican David Trott, who defeated Tea Party Republican Kerry Bentivolio 66-34 in the 2014 Republican primary, has announced his retirement after two terms. Bentivolio, who ran as a write-in in 2014 and libertarian in 2016 (taking 4.37%) is running. Also running are pro-Trump businesswoman Lena Epstein, moderate state senator Mike Kowall (10-18), state rep (12-18) Klint Kesto, former state rep (96-02) Rocky Raczkowski, and Kristine Bonds. State rep Tim Greimel of Auburn Hills, who represents 3% of the district, Suneel Gupta, businesswoman Haley Stevens, businessman Dan Haberman, Nancy Skinner, and Fayrouz Saad are running for the D nomination. Leonard Schwarz is the Libertarian candidate. District 12 (Downriver, Ann Arbor) Safe democrat. In 2014, democrat Debbie Dingell easily replaced her husband John Dingell in Congress after his 58 years (!) in office. Jeff Jones is the R candidate. District 13 (W Detroit, Westland) Safe democrat. This district has been represented by democrat John Conyers since 1964. Conyers has declined in recent years, winning only 55% in the 2012 primary due to a scandal involving his wife and nearly being disqualified due to having signature gatherers who were not registered to vote in 2014. In November 2017, Conyers announced his resignation in a sexual harrassment scandal. He has endorsed his 27-year-old son John Conyers III for the seat. Conyers’ grand-nephew, 29-year-old State senator Ian Conyers (16-P) will also run. Other candidates include Detroit council president Brenda Jones, state sen Coleman Young (10-18), rep Sherry Gay-Dagnogo (14-P), rep Shanelle Jackson (06-12), rep Rashida Tlaib (08-14), Kimberly Knott, and Kentiel White. Westland Mayor William Wild is the only suburban candidate, who could win due to a split Detroit vote. David Dudenhoefer is the R candidate. District 14 (E Detroit, Southfield, Farmington, Pontiac) Safe democrat. In 2014, Southfield mayor Brenda Lawrence defeated state rep. Rudy Hobbs, and former Congressman Hansen Clarke 36-32-31 in the democrat primary for the seat held by Gary Peters, who was elected to the US Senate. Marc Herschfus is the R candidate. No, Fred Upton is Debbie Dingell's dizygotic twin.